Artist's illustration of World View's balloon-borne capsule cruising through the stratosphere. 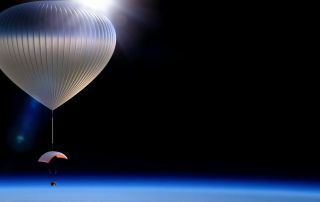 An Arizona company that aims to send thrill-seekers to high-altitude balloons for rides to the edge of space wants a new emblem, and it's asking the public for help. The Tucson-based company World View announced that it's seeking a mission emblem to represent its future passengers, or "Voyagers." The winning designer will be awarded $500 cash and a paid trip to World View's inaugural Voyager Gala. World View officials say they're encouraging a "high-level of creative freedom" for the contest submissions, though they'd like to see it incorporate some text, using words like "World View," "Voyager" or other related phrases. The deadline to submit a design is June 23. From June 24 to July 8, the public will be invited to vote on their favorite designs to advance to the semi-final round. The winner, to be announced July 16, will ultimately be chosen by a panel of judges that includes World View CEO Jane Poynter and former NASA astronaut Mark Kelly, who is now World View's director of flight crew operations. "Seeing the Earth from space is a profound experience that has the power to change lives and change the world," Poynter said in a statement. "In a small but significant way, this design competition allows space enthusiasts to be a part of World View’s journey and leave their mark on space." In an interview with Space.com earlier this year, Poynter said the concept of World View was inspired by her time in Biosphere 2, the sealed, 3.15-acre closed-loop ecological system outside of Tucson, where she spent two years with seven other people. "I went into the Biosphere because I thought it was the closest I was ever going to get to Mars," Poynter said. "I thought I was going to space, in a way, going inside Biosphere 2. But this experience also made me fall in love with the biosphere of planet Earth, and when I hear of astronauts talking about their experience of going into space, it seems incredibly analogous. "So many of them go into space thinking that's what they're doing — they're going to space — and in fact what happens is they turn around and they see Earth and they fall in love with Earth, and it really changes the way they think about things. We want to be able to give that incredible experience to as many people as we can."